On Saturday, however, the two will bring the family ties full circle when they race against each other for the first time ever in the Texas Roadhouse 200 NASCAR Camping World Truck Series races. Still, the two young men have no intention of repeating the confrontation that occurred between their fathers – Ward and Jeff Burton – following an incident years ago in a Late Model race at Martinsville. “My grandpa had to get in the middle of them, so, hopefully, we won’t have any drama like that,” Jeb said. Eight years separate Jeb and Harrison in age. They have taken different career paths and their objectives for this weekend are different. Jeb, who competed in Late Model stock cars and NASCAR’s Xfinity Series this season, has one objective: To win and take home the track’s coveted Grandfather clock trophy. Harrison, who raced Super Late Models before moving into the K&N Series, admits a top-10 finish would be “satisfying.” Harrison’s best finish this year in five truck races has been 11th at Iowa Speedway. The 25-year-old Jeb hasn’t competed in a truck race since 2015, but views Martinsville as a place where he can perform well. There is no issue with aerodynamics and ECR has helped him in the engine department. In 2013, he earned the pole for Martinsville’s first truck race that year and produced third-place finishes in both events that season. For 2018, Jeb is working on a part-time schedule “with a good team”, but hopes to find a couple more sponsors so he can race full time. Harrison’s wish list for 2018 is to improve himself. 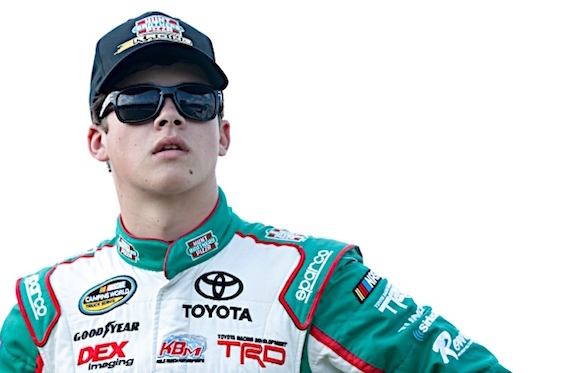 NASCAR allows a driver under age 18 to compete only on tracks 1.25 miles in length and on road courses in the truck series. A driver cannot compete in the Xfinity or Monster Energy NASCAR Cup Series until he or she is 18 years old.